If you're searching for a light-duty pickup truck that has a bold exterior, don't look any further than the 2019 Ram 1500. Whether you're looking for high fuel efficiency for driving around town or the ability to carry large loads, the Ram 1500 can be customized to meet your individual driving needs. The sleek front end combines LED headlights with advanced aerodynamics to make the most of each gallon of gas. To get the lowest frontal drag coefficient in its class, the Ram 1500 has active grille shutters and a class-exclusive active air dam that work together to increase aerodynamics while keeping the engine at an optimal temperature. At Lithia Chrysler Dodge Jeep Ram of Portland, we can help you explore any additions that could benefit you. 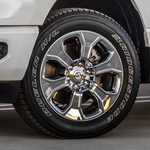 We can show you the 16 different wheel options so that you can customize your own Ram 1500 for your needs. View Our New Ram Trucks Today!